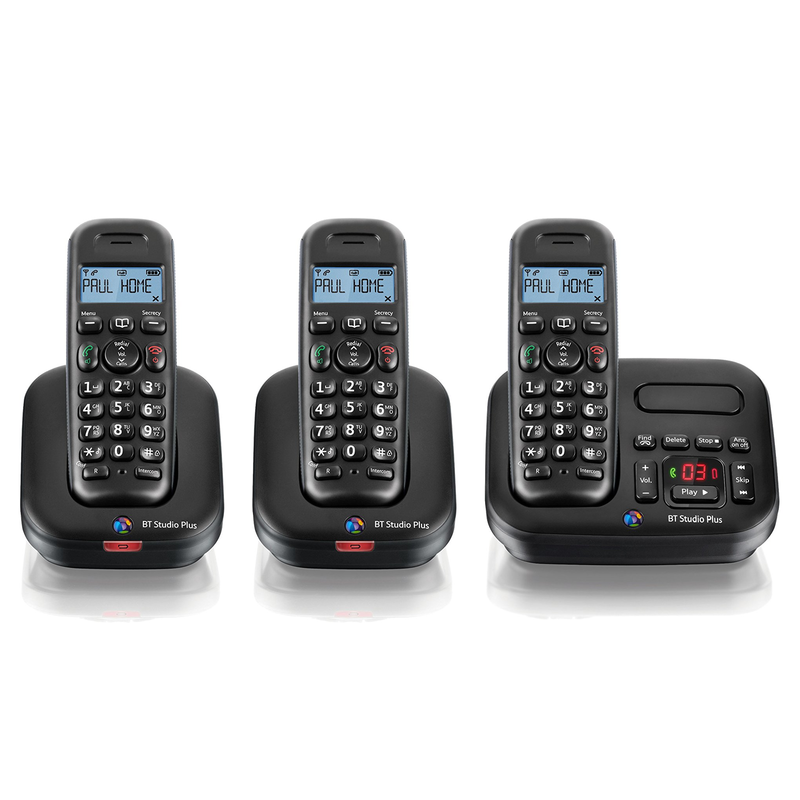 The BT Studio 5500 Plus digital cordless phone with answer machine is a stylish addition to the range of BT cordless telephones. With its stylish black/dark grey design and easy to read backlit screen this telephone will look the part in even the most sophisticated of environments. This phone comes with many useful features such as a 50 name and number directory, answer machine with up to 30mins recording time, type II caller display (so you can see who is calling, even when you are already engaged in a call), handsfree with volume control, 40 number calls list, 10 number redial list and a base station that matches and compliments the handset. Voice Mail messages from the integrated 30 minute recording answering machine can be played back through either the base or handset for added confidentiality. The base station includes a message indicator with a display that shows how many messages you have. There are 4 pre-recorded outgoing messages that can be used on the answer machine or you can record your own personal outgoing message. Up to 10 hours talktime are available on a full charge and up to 100 hours of standby time are available when not in use. The cordless digital range boasts upto 50m indoor and upto 300m outdoors. Other useful features on this phone include conference calling, call transfer and internal calling between handsets (on multi packs), music on hold, blue backlit display, five standard handset and base ringtones with volume control and on/off facility, handsfree with volume control, auto answer, secrecy feature, handset naming, keypad lock, earpiece volume control, call timer, clock, alarm, low battery alert and indicator, out of range alert and indicator and a find key on base. Call waiting (dependent on service provider specifications). Caller display (dependent on service provider specifications). DECT (Digital Enhanced Cordless Telecommunications) radio technology.